The extensive use of modern methods of examination (ultrasound investigation with Doppler mapping, aspiration (needle) biopsy, radiodiagnostics) cannot resolve the problem of verification of nodular mass in case of multinodular goiter before operation. Operative intervention is the method of choice in this case, which gives rise to the problem of surgery extent. The present study is useful in improvement of remote results of surgical treatment of multinodular goiter through statistical estimation of recurrent goiter development. The study was retrospective and included 102 consecutively admitted and operated patients with recurrent goiter and 102 patients of control group with first diagnosed and operated goiter. Patients of both groups were in euthyroid state. Patients were admitted to the Clinic of Surgery and Oncology of Raising Skills Faculty of Saratov State Medical University n.a. V. I. Razumovsky from 2000 till 2004. Statistical analyses included calculation of average mean, standard deviation and mean error. Student's ratio was used as the test of validity of average mean. Chi-square test was used for assessment of qualitative characteristics. All articles of the authors: Tolstokorov A.S., Kovalenko Yu.V. Authors: Shapkin Y.G., Kapralov S.V., Khilgiyaev R.H., Belikov A.M., Horoshkevich A.V. 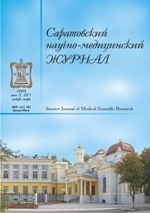 All articles of the authors: Shapkin Yu.G., Khilgiyaev R.H., Horoshkevich A.V. , Capralov S.V., Belikov A.V. All articles of the authors: Pavlov V.I. Authors: Kolsanov A.M., Kondulukov A.N. All articles of the authors: Kondulukov A.N., Kolsanov A.V. Authors: Kapralov S.V., Shapkin Y.G., Frolov I.A., Afanasieva G.A. All articles of the authors: Shapkin Yu.G., Frolov I.A., Capralov S.V., Afanasieva G.A.